What a pleasure this was to read! 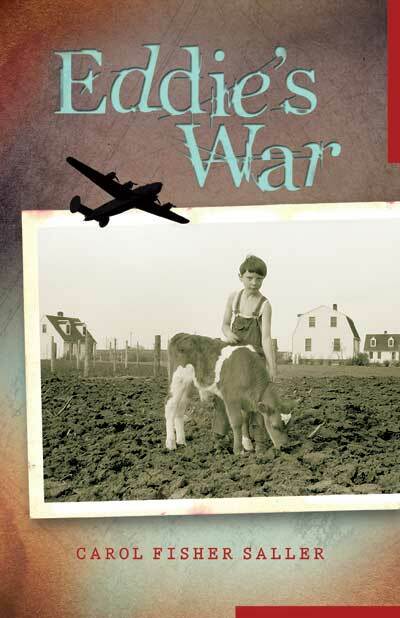 Eddie’s War is aimed at young readers (age 10 and up), and so it doesn’t offer all the complexities of plot, language, and character that books for adults often have, but that doesn’t diminish the pleasurable experience of reading about charming young Eddie and the tribulations of growing up in Ellisville, Illinois on the eve of World War II. Eddie is the younger son of Wynton and May Carl, who live on a farm in Central Illinois not far from the farm of Wynton’s parents. A smart boy, Eddie begins reading the newspapers in the town library and befriends Jozef Mirga, an older man who is looking for news about his home town in Poland. Soon Eddie is following closely the events in Europe and learns about the Nazis and their conquests. He is outraged, and advocates for America’s entry into the war: “Why shouldn’t we fight? We help our neighbors—it’s the same, right?” Others aren’t so sure, and wonder if the risk is worth it. But when Japan attacks Pearl Harbor, the doubt is gone, and local boys volunteer to fight, including Thomas, Eddie’s older brother. 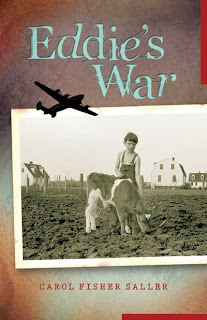 Saller portrays Thomas as a nearly ideal older brother, and Eddie’s love and admiration are demonstrated in his letters and also in his fears for Thomas’s safety, heightened when another local boy is killed at Normandy. The war has other impacts in Ellisville, too. Eddie’s budding romance with Sarah Mulberry is disrupted when he sees her kissing Private Deylon Reevy as he’s about to ship out. And Jozef Mirga—a gypsy whose family in Poland is at risk—comes under suspicion when there is a mysterious fire. These aren’t the only challenges Eddie has to deal with—he stumbles upon a family secret, for example, that helps him understand his father and grandfather’s relationship—and Saller has done a masterful job of weaving all of these threads into a remarkable tapestry. The book is told in a series of very short stories written in verse, each with its own title and date, many of which could stand alone, but also fit seamlessly into the whole. And while the book is definitely fiction, Saller discloses on her website that many of the short stories were inspired by her own father’s diary from that era, and from letters that he wrote to his older brother at war. A great deal of this book’s warmth derives from the character of Eddie himself. He’s a good kid—respectful to his elders, kind to old Jozef, a lover of animals (except snakes)—and his sensibilities and good instincts evolve over the course of the book. Early on he has a conversation with his brother’s friend Gabe: “I read about this guy over t’ Henry County, busted a killer out of jail, hung him from a tree.” Eddie doesn’t understand the fuss, since the killer would have been hanged anyway, but Gabe teaches him about justice and the rule of law, a lesson that stays with Eddie when old Jozef is arrested. This is a great young people’s book that all of us can enjoy. >Thanks for the review. I was asked to use a Korean American novel in my Social Studies class this past semester and found it didn't offer many new ideas, nor did it open any doors for my Korean students who have already heard lots of coming of age in war stories. I think this book, written from a perspective that is less familiar to them might elicit more thoughtful discussions from them. I've got it on my list of books to read, and then add to the students' list next semester if it has the cultural contrast I think they need to read about.